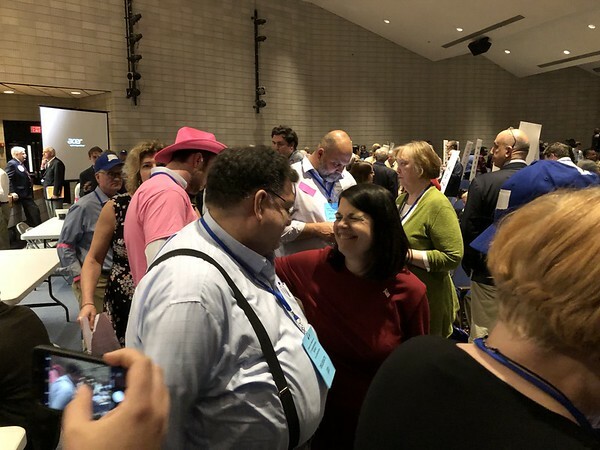 WATERBURY - After a close second ballot, Democrats in the state’s 5th Congressional District endorsed Mary Glassman as the party’s candidate for the U.S. House seat. “For all my life I’ve always tried to make public service an honorable career, and I think I’ve done that tonight,” said Glassman, a former 16-year first selectman of Simsbury and New Britain native. 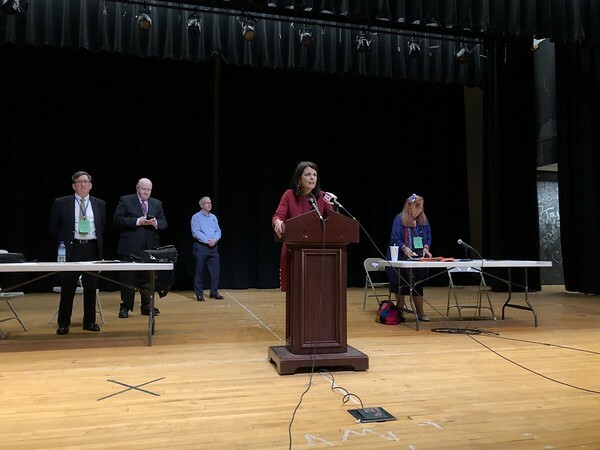 At Waterbury’s Crosby High School on Monday, 340 Democratic delegates met to endorse a candidate for November’s election. Ultimately, Glassman beat out New Britain Alderman-At-Large Manny Sanchez, 2016’s national teacher of the year Jahana Hayes, Newtown rabbi Shaul Praver and Roy Lubit for the party’s endorsement. “I’ve never forgotten the lessons that I learned in New Britain and I tell you I will not forget them when I go to Washington,” the 59-year-old Glassman said in her acceptance speech. A former reporter for The Herald, Glassman grew up on Pleasant Street in New Britain and attended the University of Connecticut. After getting her law degree, she moved to Simsbury and became a lawyer. Eventually she became involved in local and statewide politics. The seat, which now belongs to Democrat Elizabeth Esty, will be up for grabs after Esty’s announcement in March that she won’t run for re-election. Esty came under criticism when news broke alleging that she had not acted quickly after discovering her former chief of staff had harassed a co-worker. Esty fired Tony Baker three months after reportedly hearing about his misconduct and gave him a favorable recommendation for his next job. 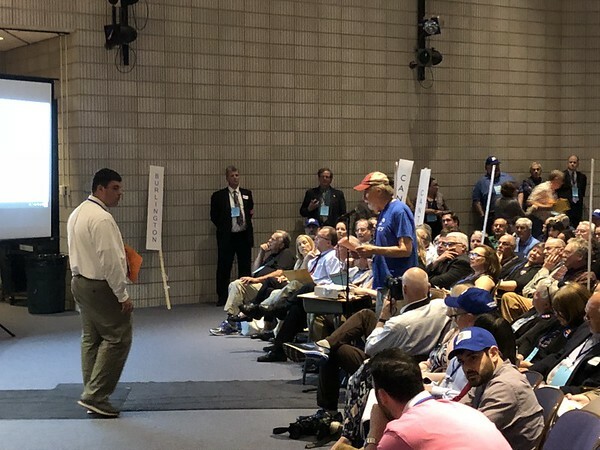 Of the 340 delegates who voted, candidates needed 171 votes to get the party’s endorsement. To qualify for the primary candidates needed 51 votes, or 15 percent of the delegates. On the first ballot, Glassman, Hayes and Sanchez all received enough delegate support to make it on the second ballot. New Britain’s 37 delegates all supported Sanchez on the first ballot. The city has one of the largest number of delegates of the district’s 41 cities and towns, second to only Waterbury’s 43 delegates. Before the second ballot, Sanchez released his delegates, removing his name from the ballot, leaving just Glassman and Hayes. “Thank you all for this opportunity. I stand here to tell you that I’m humbled by the support,” the 29-year-old Sanchez said before he released the delegates. On the second ballot, Hayes initially came out on top with 172 delegates to Glassman’s 168. But after a few switches, including three New Britain delegates switching from Hayes, Glassman received the party’s nomination. 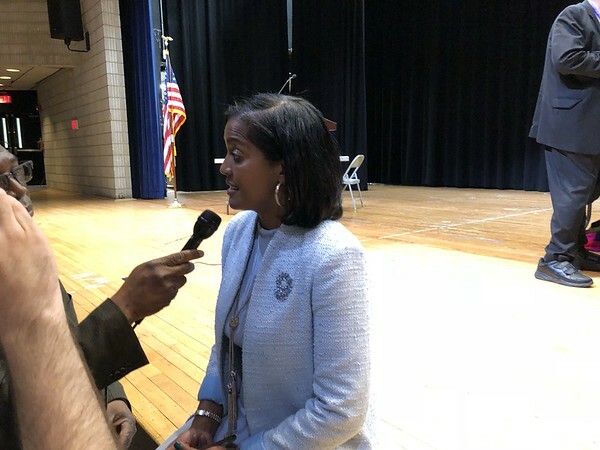 “We in New Britain have a lot of respect for Mary Glassman and Jahana Hayes,” New Britain Democratic Town Committee Chairman Bill Shortell said following the result. Hayes and Sanchez each received enough votes to challenge Glassman in the Democratic primary. Following the result, Hayes said she was proud of her supporters and how well she did in her first run for office. Hayes, who was a pregnant Crosby High School student at 17 years old, became a nationally recognized teacher during her career in the district she was raised in. Now 45, the 2016 national Teacher of the Year came within a few votes of winning her party’s endorsement for a U.S. Congressional seat. Hayes said she was leaning toward challenging Glassman in the primary. “I got in this to be your next Congressperson, so nothing about that has changed,” Hayes said. Sanchez said he will soon discuss with his campaign and the New Britain DTC to decide on his next move. 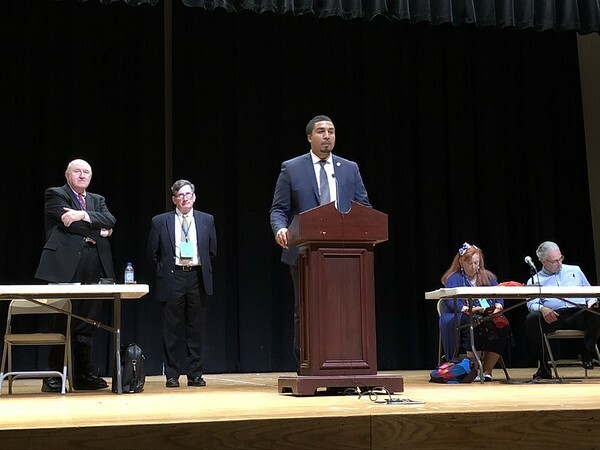 On Friday, the Connecticut Republican Party endorsed Manny Santos, the former mayor of Meriden, for the race. Ruby O’Neill and Rich DuPont both qualified for the Republican primary. The parties will hold their primary elections Aug. 14. Posted in New Britain Herald, New Britain, State on Monday, 21 May 2018 16:01. Updated: Monday, 21 May 2018 16:04.